Many of us have been talking about the inspiring work of artist Debora Stewart. I’ve been watching her video on Artist Network TV about abstracting flowers. I just love the work she does in pastel, but I wanted something fast and (hopefully) beautiful. Neocolors to the rescue! This is a 4″ square Aquabord, and yes, I am hooked. It may be quite some time before I paint on paper again. Neocolor crayons are probably one of the most versatile art supplies I’ve ever used. They are no fuss, no muss! You can work with them in your lap while watching TV, you can throw them in a bag and take them anywhere you like, you can use them with water or without. What I like best is they produce vibrant results quickly. So if you’re participating in a daily painting challenge and you’re running out of time to get tomorrow’s post ready ….. it’s all good! Neocolors feel something like crayons going dry to a surface, but when you light them up with a wet paintbrush, that’s when the magic happens. If I had to save just one art supply in a fire, this would be it. There are areas where I’ve blended smoothly with the brush into the watercolor paint that was on the surface, and other areas where I’ve left the line there to add texture and interest. I can see myself doing more experimentation with abstracting flowers, using unexpected colors, shapes, and compositions. I’m looking forward to continuing to play with watercolors, Neocolor crayons, and Aquabords! So far, it looks like a match made in heaven! I wish you all a creative, warm and joyful weekend. Peace and bring on the paint puddles! Neocolors is next up on my “Want List” for art supplies. What you’ve done with them here is absolutely gorgeous! And fun, too. Like you, I’m having a good time playing with Debora Stewart’s ideas and inspirations. Abstraction is one more way of approaching art, and the results can be very intriguing. Thanks Judith. 😊 Every painting is a journey. Kerfe’s Neo painting made me realize how much I missed them. So versatile and when combined with WC, shazam! I bought them when Penny became ill last August and that’s when my abstract journey began. Painting my feelings really helped me deal with that situation. And these guys seem to have a direct connection to my feelings. So I love them. I’d never really thought about how painting can help us deal with difficult times. I’ve been fortunate that life has gone smoothly since I started learning to draw and paint. I can see how art could be a sense of comfort and a way of coping. It’s good you had your creative abilities to turn to. For me, art has been really therapeutic. I think abstracts in particular allow us to connect and express feelings. I remember one ugly painting expressing frustration, but for most of them, I imagined myself on the shore of a lake and painted my feelings as I stood there. People commented how calm and peaceful they felt looking at them, and that’s when I discovered that artists are recyclers (or can be). We can take pain and make it beautiful! And give the peace to the viewer, even from our pain. Pretty powerful stuff. Very powerful thoughts. You’re right about how abstracts allow us to connect with our feelings. Expressing emotion is what art should be about, isn’t it? I think so. That’s why doing little “assignments” from classes aren’t nearly as meaningful as choosing subjects I want to paint. It’s an entirely different thing. Of course, the classes and assignments have helped me develop the skills I need to express those things that do have meaning for me. I guess it’s a bit of the “right brain/left brain” thing again. We need both. We have to use our head and our heart. You did the same thing with your green painting! It was transforming for you. It’s always transforming. Art is amazing. I don’t know how I got by for so many years without it. I suppose my one regret is that I waited so long before I started this journey, but I know I obviously wasn’t ready to embark upon it until now. Everything in its own time, as they say. It’s true. I’ve thought the same, but you’re right. Thanks, Rebecca! Maybe time for some neos? Or will you be working in oils? Oh still on the oils, nearly finished them all today, just some small extra bits of glazing on a couple, then I can actually do a post. ……. Then I started on a background of another huge canvas, 1 metre high, I’m getting bigger! Mind you once the backgrounds are done ( 4 more to do, base coat primed waiting for a colour wash background, all are huge, for some horses following my Tenor horse photo shoot) I can then put away and do something different during the week, I hope. Rebecca, how do you do it? How do you work so large? Did you gradually work up to it? I’d love to work larger. Thanks, Johanna! Love abstract florals, hopefully more to come! So, I look at this and want to get my camera since I’m sure an abstract butterfly will land on one soon! Ooh, an abstract butterfly, now that would be cool! Thanks, Kathy! Oh how lovely Loo! I recall us doing these purple coneflowers months ago. I long to try them again too! These are FABulous!!!! Every time you talk about new products, I want to try – like these neocolors, but I am really trying to stick to my guns and work with watercolor paints alone. It will take me a lifetime to master! LOL! Doing some painting this morning. A birthday card for my DIL since we are going to celebrate tonight, and a (hopefully) birthday painting for my BFF. Fingers crossed! Totally get it!!! The white drives me mad too! I’ll give some thought to the challenge Sometimes that stresses me though lol!! Well, but that’s part of the process. Letting go. And think of the inventory you could build up lol! This is one reason I’m painting so much now. Trying to come up with some stock for my shop or for images or both, or whatever I decide to do. I’m still stuck in the mire of pixels and dpi! Oh, the learning curve. It could be really good for you, could skip you ahead! Something to think about. You have lots of time. Gosh – as I look at these again – I see how Farrrrrrrr you have come in your art! woohoooo to you loo! Thanks, Jodi. I’m gonna say drawing daily and jumping off into abstract (which I have to thank Penny for, remember last August, she gave me a little gift there, my sweet one) is the reason. Painting every day this month has really helped too. My memory is so bad, that daily reinforcement really helps me remember what I learn. I am bad at writing stuff down, other than in WP. 💜 Thanks for being a wonderful cheerleader! Hey. I have a Deborah Stewart video on in the background. She is doing coneflowers!! Interesting techniques. That is the video I was watching last night before painting this! I was thinking of her photo and of our coneflowers too. Carrie, I can’t say enough about them. I resisted for a very long time thinking “crayons?! I know about them and they’re clunky” but these things are not your Crayola set. They are buttery and melty with water – you can lose the line completely if you choose to – they’re like taking a bath in melted chocolate. That’s the best way I can describe them lol. Carrie, you have restraint. I do not. lol. Not when it comes to art supplies. Good for you tho! Just lovely. Love the natural feel/positioning of the petals. Well done! Thanks, Frank. I may try this some more, I almost want the petals to be dancing or flying. I want lots of breeze in them. I really appreciate your comment! Beautiful flowers. Have a creative weekend! Your flowers are fantastic…don’t wash them off! You make me want to play with a small pack of aquabord I have in my stash. After the move! I also need to experiment with my neocolors. So much to do ..aren’t you glad art is part of us! I have Neocolor crayons! My first “watercolor” portrait was done with them. 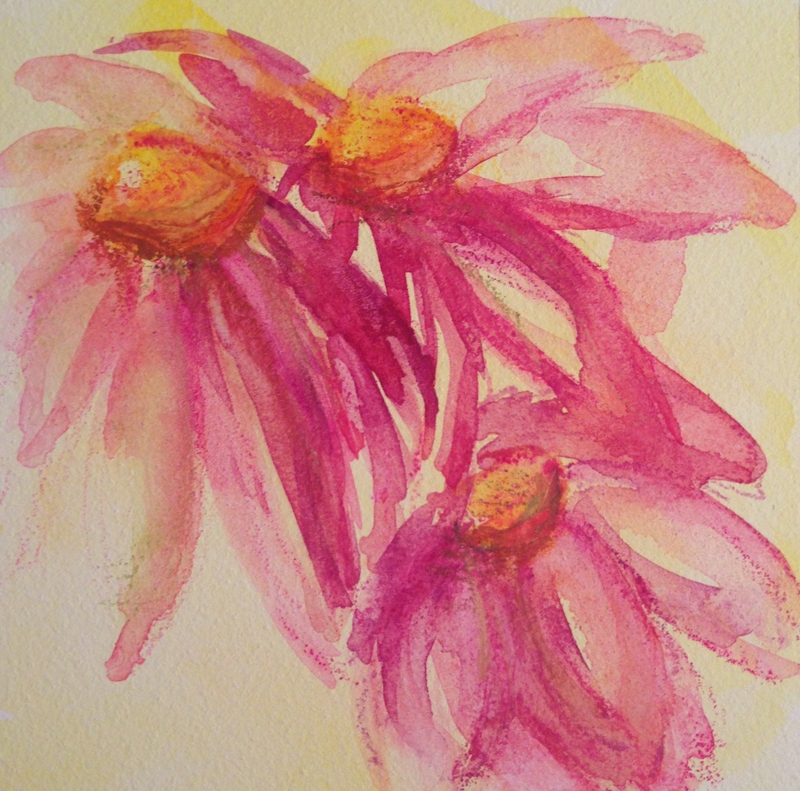 I love your painting….I think that the bottom flower looks scrunched that is all….but not sure if you should wash it away. Give it thought before you threaten that poor flower! At some point, I will work larger and then a third flower won’t be a scrunch. This is only a 4″ square. I do have 5″, 6″, and even some 5×7″ in this aquabord. Maybe I should break out the actual watercolor paper. And work larger *gasp*! Hey Margaret I have a question. I ordered some 300# WC paper and haven’t tried tearing it down yet. I’ve only worked on the small samples blick sent me. But it feels like cardboard almost, it’s so heavy (as you know). When I tear down my 140# paper, I crease it back and forth and then tear it so you get the nice torn edge. Can you still do that with 300# paper? Or do you have to cut it with a knife or something? I remember when I had been given a piece by a mutual artist while plein air painting, she handed me a piece 8 x 10 (or so) and it had been torn. I have no idea since I have only bought it once and I used the entire piece. I would google it and see because like you say, it is as hard as cardboard and getting it to fold over to rip it would be difficult. I wish I could tell you but like I said, this lady gave me a piece that had torn edges. I would imagine if in doubt, using a knife would be safer. Hmm ok thanks Margaret I’ll look into it. May just call an artist at Blick if I have no luck! Will report back. If I remember. lol. I’ll remind you because I was wondering how to rip the 300 # as well. That is a thought, good one Margaret! Do you have a rotary cutter? Yes I do! and that no scar board that you cut with it….I bought it when I was doing quilting. The whole reason I got into art because I wanted to design my own quilts. Omg. Me TOO! That is freaky!!! LOL! wonders never cease! that was back in….hmmm wow….’88 or ’89. Boy, am I ageing myself or what! now my secret is out….I am over 30! Lol! I was married in ’89 but it was August of ’14 that I decided I wanted to make a series of small art quilts on freedom. But couldn’t draw a bird in flight, a simple silhouette. This drove me bonkers. You’d think I’d have just traced an image, but instead I became determined.to.draw.a.bird. Very stubborn and determined and it took me months to get a silhouette I was happy with lol! The bird in my av was the result of my husband throwing bread crumbs to birds at the beach so I could take photos of them in flight. Did you make your quilt, or quilts? Did something specific spur you on? I really enjoy your work and your dedication towards arts is really inspiring! So sorry to hear about your cat! Neos are the best thank you for getting me started Laura! I think it was something mentioned about being smooth as butter that intrigued me. Your flowers are beautiful, and that aqua board! Need to just try the two I bought a while ago. For some odd reason I think they are too precious to use, I forget I can wash it away. Yes! Not too precious at all, easily washed, and I keep forgetting to post what Ampersand told me but you’re really not suppose to submerge them and I don’t think they recommend running them under the tap faucet the way I do. Mine are very small and I’ve not had a problem but the bigger pieces of Aquabord can be pricey so not sure I’d risk it with those. A damp paper towel though, absolutely or even a damp qtip or stiff brush to get back to the white should be totally fine. I am hooked on these things! I love the fixability of them as I really stink at WC still. Well your flowers are just lovely! Glad you’re enjoying the aquabord! And I don’t tend to get on well with dry to wet watercolour gizmo’s but these neocolours seem quite interesting…. Thanks Vicki. There are so many ways to use Neos. Kerfe dips them in water and uses them that way. They put down a lot more pigment than I prefer that way so I just use them dry and then you can actually run a wet brush in and get rid of the line totally. I put some light olive in the flower on the left, the petal that’s almost not there and it totally melted all of the lines. It’s a dreamy pigment on a wonderfully forgiving surface. Thanks, Tierney! I’m glad you stopped by, even though you had to make a special trip hehe. Those neocolors really are cool. They even work on fabric, and apparently can be heat-set with an iron to make them permanent. They’re pretty versatile! Do you ever paint your fabric, Tierney? Beautiful flowers! Love the vibrancy and glow that they have. You are so right when describing Neocolor crayons as being versatile and fun to use and your enthusiasm and zest for the process really sings in your artwork. Thanks for sharing the joy. I love the lite and airy feeling of the flowers. I’ve never tried Neocolor crayons or aquabord. I must give them a try. I have surgery June 14th, and this might be the perfect medium to use while recovering. Laura is there a book on the different techniques used with these crayons? Thank you Laura, and I may need to ask you for tips. No worries, glad to help, Connie! I hope you love them as I do! You didn’t miss it, Jill, I keep forgetting. I just made myself a note. Posting a painting daily can be exhausting. I do like it but I was in bed half the day with a bug or maybe it was just tiredness. And then I posted a little 3×4″ painting I made at the end of the day last night and once again forgot to put this info in. Hopefully I remember tonight but you can always go to the Ampersand site and call the toll-free number. You’ll probably have questions I didn’t ask. We’ll see if I remember tonight but it’s looking like another tired day. And the rain! I do love rain and I love cool temps but if you’re feeling tired rain kind of amplifies it. I’m glad you like the painting. Thanks, Susan! Love those Neos! Hey Laura! How are you feeling?